Maybe I thought husking corn was fun when I was eight, but a bushel of ears later I decided I hated husking corn. The silks stuck to my bare, shorts-clad legs, there were usually bugs in the husks, and I didn’t like eating corn on the cob and getting all those kernel skins stuck in my teeth. 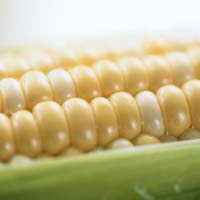 Now I love eating corn on the cob, especially Peaches & Cream corn from Iowa, but I still don’t like husking corn. Last summer, we were out on my parents’ deck husking corn. I was doing it gingerly, peeling each husk off individually, trying to avoid getting dirty. “What are you doing? That’s not how I taught you to husk corn!” Mom told me. So I went back to the way I used to husk: I tore half the husks off the ears of corn, and then tore the other half off. Voila! I had a pile of corn in no time, ready to be steamed, buttered, and devoured. Mom is teaching her grandchildren the fine art of husking corn. Brushing off the sticky corn silk! Kids are useful for a lot of things if you proposition them the right way. Shucking corn IS fun. Of COURSE. I love corn on the cob. Yum. When you only doing a few for a meal it's not so bad. That silk just sticks around like glue. I can't imagine doing bussels of it!